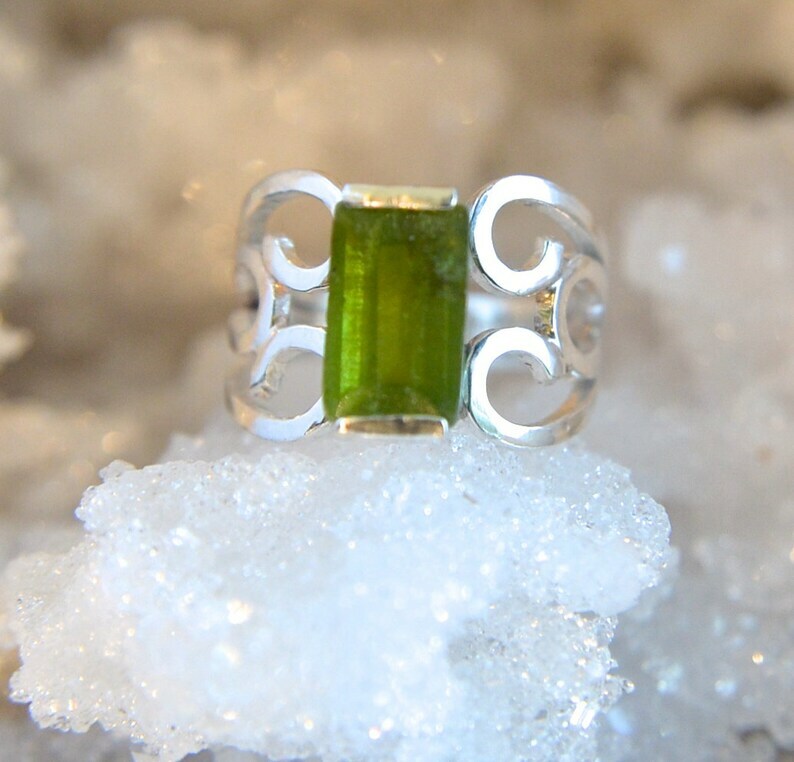 This ring features a natural Vesuvianite gemstone. And what is that you ask? Vesuvianite is a gemstone first found on Mt. Vesuvius, which I think makes it really cool. It's supposed to be the gemstone that leads you to your hearts desire. I wish that I could promise you that but instead I'll promise that it's a very unique gemstone that will a little piece of nature on your finger. Vesuvianite comes in different shades of brown, yellow and green. This one is a rich moss green. As you can see from the pictures, there are things going on inside the stone. That's typical of Vesuvianite and just adds to its charm. It will make you wonder about this piece of ancient history that you have on your finger! Also know by the name Idocrase, this funky gem is 11x6.5mm and 3.54 carats. The Sterling Silver band was handmade by me, one little piece at a time. I started with three square wires and then formed a ring to fit the gemstone. You will find sweeping curls on each side that come together to hold the Vesuvianite. The band is just over 3mm on the palm side and then around 14mm near the stone. This is a large gemstone but it sits very flat to the hand making it easy to wear everyday. Life is too short to wear ordinary jewelry!